There was a time when European economists looked at Latin America with horror. Weighed down by debt, plagued by hyperinflation, and ravaged by unemployment, the region was a financial disaster zone. As the leaders of Latin America and the European Union (EU) prepare for their seventh biennial summit in the Chilean capital Santiago this weekend, the region is enjoying unprecedented stability and prosperity. The EU-Latin American relationship has been somewhat turned on its head. These days, it is the Europeans who are grappling with austerity measures, joblessness and an intractable debt crisis. "The European Union is going through a very difficult time in terms of its economic crisis, stagnation, unemployment and fiscal deficits," Chilean President Sebastián Piñera told reporters in Santiago ahead of the summit. "Latin America is going through a very positive period, both compared to the rest of the world and to its own history. The 19th and 20th centuries did not belong to us. We hope the 21st will." The economies of Latin America and the Caribbean grew by 3.1% last year, comfortably outstripping global growth of 2.2%. In Panama, the economy grew by 10.5%, in Peru 6.2%, and in Chile 5.5%. Compare that to the eurozone, where the economy contracted by 0.5%. In each of the past eight years, Latin American economic growth has outstripped that of Europe, and will do so again in 2013. The United Nations' Economic Commission for Latin America and the Caribbean (ECLAC) predicts the region's economy will expand by 4% this year, while the eurozone will grow by just 0.3%. While Spain, Greece and Portugal deal with double-digit unemployment, the jobless rate in Latin America fell to 6.4% in 2012. Many Latin Americans who migrated to Europe in search of work in the past are now returning home. At 5.8%, inflation in Latin America was higher last year than many would have liked, and in Argentina and Venezuela - still economically volatile nations - it was closer to 20%. But inflation is still lower than in 2011. 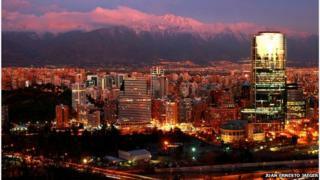 In Chile, regarded by many as the region's best-managed economy, it was just 1.5% last year. Sensible governance and wise central banking have also played a role. Some Latin American nations have used counter-cyclical policies to cushion the effects of external shocks. In 2009, many used fiscal stimulus packages to keep their economies on the rails. The region's public sector debt is below 35% of gross domestic product (GDP). In several countries in Europe - Italy, Belgium and Greece among them - it is over 100%. "There is no longer that fear that Latin American governments are going to over-spend," said Alicia Bárcena, a Mexican economist and executive secretary of ECLAC. "Macroeconomic prudence has become mainstream in Latin America. Almost everybody understands that low inflation, good fiscal accounts and healthy international reserves are essential." There are still problems, of course. Latin America remains the most economically unequal region in the world. In Brazil, for example, the income gap between rich and poor is vast. Governments have made some progress in addressing this problem over the past decade, but not enough. Brazil and Argentina, the first and third biggest economies in the region, underperformed in 2012, with growth rates of 1.2% and 2.2% respectively. The region needs them to rebound in 2013. The tax take in Latin America is still low and tax systems are often regressive compared to those in Europe. That leaves Latin American governments with little spare cash to spend on social policies. And the economies of Latin America need to diversify more. Whether it be copper in Chile, oil in Venezuela, soybeans in Paraguay or tourism in the Caribbean, too many countries are overly reliant on a single commodity or industry. This weekend's summit, which brings together around 40 heads of state from 60 nations, offers a chance to address some of these issues, and also to see how Europe can learn from Latin America's traumatic debt crisis of the 1980s. For Francois Bourguignon, director of the Paris School of Economics, there are similarities between Latin America then and Europe now. "We know that Greece will never repay its debt, and we've started restructuring it… I believe we will have to do the same with Spain, and probably Italy, and maybe Ireland and Portugal," he said. "So I think there are some lessons to learn from Latin America on the best way to restructure your debt without completely frightening off your investors." Despite its current woes, the EU remains the world's biggest economic bloc, accounting for around a quarter of global GDP. It is the biggest investor in Latin America, accounting for 43% of all foreign direct investment in the region. The EU invests more here than in China, India and Russia combined. This year promises to be a landmark year for EU-Latin American trade relations. Colombia, Peru and Central America are all ratifying Free Trade Agreements with the EU and are likely to complete the process before the end of 2013. The Europeans arriving in Santiago this week are in for a pleasant surprise. Not only will they swap the cold and snow of the European winter for the heat of a Chilean summer. They will also find themselves in a country and region that is thriving as perhaps never before. That might help them take their minds off the economic plight of their own continent and focus on a brighter future.